If you’re looking for a simple and effective method of keeping any bathroom essentials neatly stored and within easy reach, you will need to install any of our glass shelves and storage products. 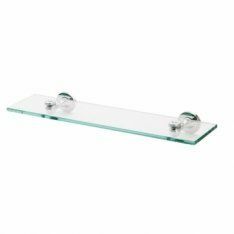 Our selection of glass shelves for sale are part of the LX bathroom range and come with all the required fixing screws, wall plugs and fixing plates. Any commercial or domestic building will need to have toilet roll holders in place within bathroom facilities. This will make sure people can easily access toilet roll methodically and will also increase the overall hygiene within your premises. We have both static and rolling designs that have been made from high-quality materials like polished chrome and satin stainless steel. Towels need to be clean at all times in order for them be suitable for use. By installing any of our towel rails, you will be able to store towels neatly and ensure they are easily accessible after you have finished using a shower or bath. Within our range, we have single, double and curved designs that are suitable for both contemporary and traditional bathrooms. It is equally important that small hand towels are stored in a neat and practical fashion. We have a selection of towel rings in stock, which are part of a modern-day range and come with a concealed fix rose. We also store a wide range of soap dishes and dispensers to ensure soap can be accessed easily. You can choose from either a satin stainless steel soap dish or a polished chrome tempo triangular soap basket, which have both been manufactured for a long-lasting and radiant finish. Toothbrushes are another common piece of bathroom equipment that will need to have a suitable storage system in place. With any of our toothbrush holder products, you will be able to store a number of toothbrushes neatly. Our designs are wall mountable with certain models adopting a frosted glass effect. To further increase the hygiene within your bathroom, you will need to make sure you have toilet brush holders in place. We store contemporary designs that are suitable for any type of establishment. All of our models are part of the Deleau range by Carlisle Brass and come with a 10-year mechanical warranty. Robe hooks are the simplest way of keeping any bath robes both neat and clean. Depending on the style of your bathroom, we have both modern and traditional designs that have been manufactured into a variety of shapes and sizes. If you are part of a household which is occupied by a number of people, you will need to install one or our bathroom cabinets. This will provide an easy way to organise each person’s equipment and ensure anything can accessed in a simple manner. We have both single and double panel designs with certain models adopting mirror doors. We also have a multitude of bathroom mirrors in store, which have been specially designed for a variety of bathroom tasks. One of our signature models is the Apollo mirror with integrated lighting, which can be fully lit up by simply pulling onto a cord. Many bathrooms will have a showering facility in place, which means having the correct equipment installed is of paramount importance. One of the most essential components for any shower would be the shower curtain rail, which holds up the shower curtain. Any style shower can be catered for since we stock a variety of bendy models which can be shaped into any required size. Once this has been installed, you will be able to attach one of our corrosion resistant shower curtains and rings. Our range of products use a Proseal coated fabric which enhances the water repellency. Grab rails are also needed for any households which have a bathtub facility. This will ensure people have been provided with additional support as they are entering and exiting the bath. We have a selection of sturdy models which have been made from materials like polished chrome and satin stainless steel. Finally, if you are looking for an effective method of supporting any clothes as they are being dried, you will need one of our pull out airers. Our designs are easily installed and can be deployed within both indoor and outdoor balconies.